This page is maintained for archival purposes only! PlasmaCAM offers projects that you can cut on your machine. If you want to build something but don't feel incredibly patient and creative, you can simply load a project from disk and cut it. There is no limit to the number of duplicates you can make, provided you don't distribute the computer files to others (a violation of copyright law). You can even take pieces from different designs and combine them into a new, unique design. Right now you can purchase the Mike Elin Old Frontier art CD, which contains about 30 intricate silhouette scenes - as well as an alphabet. Examples from this CD are shown above and throughout this web site. 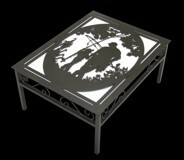 These images have been designed for use in various metal projects and are ready-to-cut on your Plasma CAM machine. "I cut a bunch of stuff from the Frontier Art CD last night. That was the most fun I've ever had!" 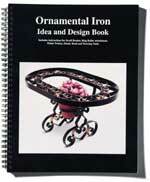 If you're interested in ornamental iron, Shop Outfitters has a book full of great project ideas and design techniques. Shop Outfitters also makes various metal working tools for ornamental iron such as benders, rollers, picket twisters, scroll benders, and more.